The budget sequester has garnered a lot of attention in recent months. Shrouded in hyperbole and doomsday predictions, it has been difficult to get a clear picture of what the budget cuts mean for the U.S. economy. That’s the way Washington likes it, but it’s not as complicated as it seems. By most economists’ estimates, the sequester will shave 0.5% to 1.0% off of GDP, depending on the assumed multiplier for government spending. Some economists put this multiplier at about 1.5, while others argue that defense spending in particular, and government spending in a weak economy in general, command higher multipliers. In any case, I estimate that adding the sequester to December’s fiscal cliff deal results a net loss on the order of 1.5% to 2.0% of GDP in 2013. That is, the U.S. economy is expected to grow that much slower than it otherwise would have because of higher taxes and reduced government spending. In an economy that grew only 2.2% in 2012 and is struggling to reduce unemployment, overly aggressive fiscal austerity is a clear risk. For example, the UK has recently gone through several rounds of austerity, and its economy has subsequently struggled to grow — shrinking in five out of the past nine quarters and, ironically, the debt-to-GDP ratio has actually risen. In the U.S., the outlook is less dire. The latest poll from The Economist calls for about 1.9% GDP growth in 2013, which likely assumes about half the effect of the sequester. Using the consensus forecast as a benchmark, if the sequester is left fully intact, economic growth might be closer to 1.5% to 1.7% this year — not a recession, but too sluggish to reduce unemployment. However, I would argue that predicting the sequester’s economic impact down to the decimal point misses the big picture. One of the critical challenges plaguing the U.S. recovery has been heightened policy uncertainty. Businesses continue to hoard record levels of cash, in part, because they are concerned about looming changes to tax rates, tax expenditures, regulatory decisions, and the overall role of government. Inside the Beltway, uncertainty is perhaps good for business, but it has taken a significant toll on the U.S. economy. A study by the Federal Reserve Bank of San Francisco suggests that policy uncertainty has added one full percentage point to national unemployment. That translates to about 1.6 million jobs. Considering the weak economic recovery and Europe’s recent experiences with austerity, one would expect a serious discussion about the role, timing, and the appropriate size and scope of fiscal austerity measures. Unfortunately, a serious discussion has yet to materialize — and this is where the real danger of the sequester lies. It is the latest, and perhaps most bizarre, in a string of self-inflicted wounds. The sequester is one of the worst ways to go about budgeting, as it ignores any reasonable goal of achieving more effective and efficient government and instead assumes a smaller government by any means is better. As David Brooks put it, the sequester causes “maximum political disgust for a trivial amount of budget savings.” If this is the new blueprint for policymaking, it’s difficult to imagine meaningful reform to the country’s long-term fiscal challenges. But, perhaps there is a silver lining. President Obama scored a victory by raising tax rates on the wealthy. Republicans can now claim a victory by cutting the budget. The game is tied 1-1. So, can we finally have that discussion about long-term fiscal reform? Basically, I am in agreement with Adam Karson’s forecasted impact of the sequester on the 2013 GDP growth rate, but maybe more towards the low end of their range. Keybridge Research is without a doubt one of the best economic consulting resources to the equipment finance industry as they seem to have the right mix of inputs for net business investment forecasting by asset classification. However, I have a couple of comments relative to the points Adam makes in the last two paragraphs of his commentary. Austerity in UK. I know this has been a common analogy that many politicians point to when taking the side of not wanting to reduce government spending. Japan is also thrown around a good deal as an example of what not to do in terms of reducing government spending. However, the UK and Japan are not the U.S. The UK economy is structurally much different than the U.S. Point in fact, according to the Organisation for Economic Co-Operation and Development (OECD), 2011 GDP per capita (in US dollars) for the U.S. and UK were $48,200 and $35,700 respectively. GDP per hour worked was also lopsided towards the U.S. GDP per capita and GDP per hour worked are good measures of a country’s productivity. I am not sure it is fair to say that the U.S. worker is more productive than the UK worker because our economic bases are much different. The UK is a financial center and their economy is more services oriented than the U.S. economy (e.g. Boeing, Caterpillar, GE, Apple, Microsoft, etc…). The U.S. essentially manufactures more high-dollar products. So when the government in the UK cuts spending in the wake of a financial induced recession, it has a deeper impact. That is my hunch. Cash on companies’ balance sheets is at record levels because the current administration’s fix to every social or governmental challenge is to raise taxes on people / businesses that have a modicum of success from their daily toil. This success however is viewed as “luck” rather than earned. They would replace the inequity of “luck” with more government by spending or “sharing the wealth”. As stated by this President during one of his campaign speeches during the election, and I paraphrase, “the best way to get even with them is to vote”. Who is them? So, I would say that businesses are holding great amounts of cash not because of uncertainty, but rather the certainty that they are on the menu for the great American pig out. After all, they are the only source for the vast majority of federal revenue. As for David Brooks, well I’m impressed that he admits that the $85 billion is a trivial amount as a percentage of the $3.7 trillion budget and climbing. For those who pay attention (read and pay taxes), the fact that both parties made a good show of the outrage over the sequester yet failed to lift a finger to alter the course, that is very comforting. This might be the first time they actually can claim that they were around to see the government accept a real honest to goodness spending cut. I am proud of both parties in Congress and the President for the sequestration idea. Brilliant really! At the end of the day, this sequester will fade into memory. As I mentioned in my December blog for Equipment Finance Advisor (the sister website to ABL Advisor) titled "Falling Over the Cliff - Or the Courage to Jump", Congress will find a way after the sequester is implemented, to give some money back. Sure enough, on March 6th the House passed HR 933 which basically gave the defense department some flexibility in how to apportion their required spending cuts more creatively. In addition Congress appropriated back a few billion dollars more for defense. So, sleep well knowing that any organization that big can find a few dollars of waste and efficiency improvements without hurting national defense. It is thought that this bill will be accepted by the Senate in some form and signed into law. After all, congress has less than two weeks before their recess and they still have to tackle the continuing resolution to keep the government funded. 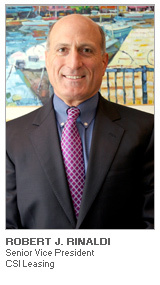 Bob Rinaldi is Senior Vice President of CSI Leasing, working on organic and inorganic growth strategies. Previously Rinaldi served as Executive Vice President of National City Commercial Capital Company (NC4), which became a part of PNC Bank, and President of NC4 Canada. Rinaldi has almost three decades of experience in the equipment leasing industry with positions including Senior Vice President of Provident Bank and Executive Vice President and Principal at Information Leasing Corp. (ILC). As a founding partner of ILC, Rinaldi helped grow the company to the fifth-largest bank-owned leasing company in the U.S. He received a BS from Michigan State University and is an active member of the Equipment Leasing & Finance Association (“ELFA”). Adam Karson is a Director at Keybridge Research LLC, where he specializes in international economics and finance. Mr. Karson heads Keybridge’s economic outlook and forecasting service offering, including providing regular macroeconomic and industry-level analysis for the Equipment Leasing & Finance Foundation. With more than a decade of experience in economic consulting and financial markets, Mr. Karson has a strong track record of providing economic advisory services to help improve businesses’ strategic decisions across multiple markets in the U.S., Europe, and the Middle East. He holds a Bachelor’s degree, with Honors, in Economics from Johns Hopkins University and a Master’s degree in Public Policy from Duke University.